This past Saturday, Feb. 24, the University of Wisconsin–Stout Events Society hosted their second annual Masquerade Dance. Last year’s theme was Enchanted Forest, and this year, keeping the fantasy style, the Stout Events Society took on Beauty and the Beast. The event was officially titled the Enchanted Rose Masquerade. During this free event, drinks and finger food were provided to the guests who chose to get dressed up and don a masquerade mask. The group also aids in hosting other events in the area. The Stout Events Society most recently participated in the Gifts of the Heart Benefit, which raises money for the Menomonie Free Clinic. They have also been involved in the Jeans and Jewels Gala for Dunn County Foundation and the Twin Cities Kidney Walk in St. Paul for the National Kidney Foundation. 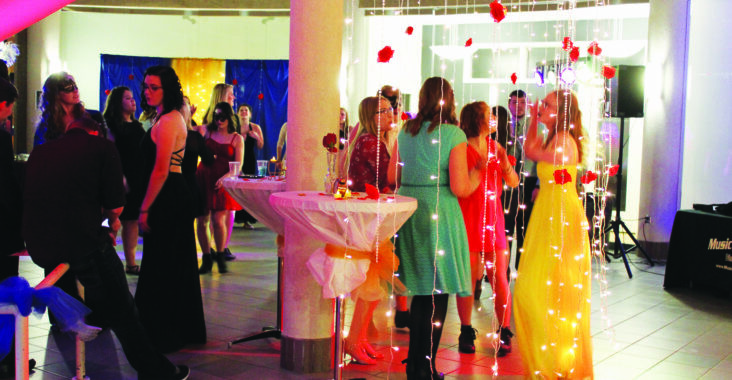 “We had a pretty decent turnout for the dance this year with about 100 or so students,” said Miller. Miller suspected that the heavy snowfall that night might have contributed a lower number of participants as compared to last year and said that the Stout Events Society plans to move to dance to April from now on to avoid any bad weather. “Everyone who did attend seemed to have a blast. I know I did!” Miller said.